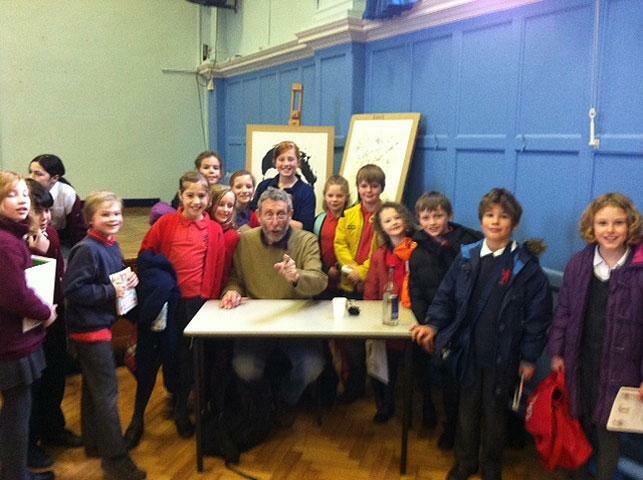 On Wednesday 18th January, 12 lucky children got the privilege of meeting Mr Michael Rosen! It all started with a simple poetry competition. 12 amazing poets took part. Sadly Miss Bray could only take 6 children! The 6 lucky children were very excited. The other children were very disappointed with their loss. However, a few days later Miss Bray called the unfortunate ones to her classroom to present them with some great new! When they arrived they were delighted to hear that a school couldn’t go and they could go! So on 18th January those 12 children, who were accompanied by Miss Bray and Mrs Fursden, leapt on the Collis minibus and away they went to go and meet Michael Rosen. On the way there, the minibus was full of excitement. No one could stop talking. Everyone was so excited they didn’t notice we were there Richmond Park Academy! This is where we were going to see him! We were late so we got to sit in the front! Yay! Michael Rosen was really funny. He talked about his family and more about his Dad and brother. He told us where he got his ideas and how he became a writer. After the amazing show we all got our books signed, there was a ginormous queue to get it signed. Richmond Academy came round with biscuits and drinks so the queue went quickly. It was soon all over so we jumped back in the minibus and went back to school. On the way back everyone was so excited about their signatures there was even more talking than on the way there! When we got back to school everyone was so excited about telling their friends about the trip!